Seoul is the capital and largest city of the Republic of Korea (South Korea). With a population of over 10 million, it is one of the world’s largest and busiest cities and is by far the most densely populated city among OECD nations. The Seoul National Capital Area, which includes the Incheon metropolis and most of Gyeonggi province, has 24.5 million inhabitants, and is the world’s second largest metropolitan area. 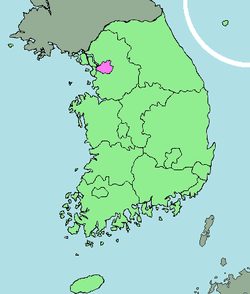 Almost half of South Korea’s population live in the Seoul National Capital Area, and nearly a quarter in Seoul itself, making it the country’s foremost economic, political, and cultural center. Seoul is located on the Han River in the center of the Korean Peninsula. The city became the capital of Korea during the Joseon Dynasty and the Korean Empire. The Seoul National Capital Area is home to four UNESCO World Heritage Sites: Changdeokgung, Hwaseong Fortress, Jongmyo Shrine and the Royal Tombs of the Joseon Dynasty. Seoul is considered to be a global city. It hosted the 1988 Summer Olympics and co-hosted the 2002 FIFA World Cup, and will host the November 2010 G-20 Summit. It is one of the world’s top ten financial and commercial centers, home to large conglomerates such as Samsung, LG and Hyundai-Kia. In 2008, Seoul was named the world’s sixth most economically powerful city by Forbes.com and 86th for quality of life by Mercer. Seoul is the 2010 World Design Capital and has a technologically advanced infrastructure. Its Digital Media City has been a test-bed for some IT and multimedia applications. Seoul was the first city to feature DMB, a digital mobile TV technology and WiBro, a wireless high-speed mobile internet service. It has a fast, high-penetration 100Mbps fibre-optic broadband network, which is being upgraded to 1Gbps by 2012. Seoul Station houses the 350 km/h KTX bullet train and the Seoul Subway is the third largest in the world, with over 2 billion passengers every year. Seoul is connected via AREX to Incheon International Airport. ← KOREA… where is this country?